Bravo Media cordially invites you to celebrate the wedding of Kandi Burruss and Todd Tucker in the upcoming docu-series Kandi’s Wedding. Against vocal family opposition that played out dramatically in season six of The Real Housewives of Atlanta, Kandi and Todd have decided to move forward and tie the knot. Each episode follows Kandi and Todd as they plan a larger-than-life “Coming to America” themed wedding ceremony, signifying the couple’s initial introduction in Africa. The two are confident that they can pull off their dream wedding without the help of a wedding planner — and in only five short weeks. Adding to the pressure of a major time crunch is the reality that family drama is never far away. 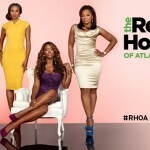 Kandi and Todd are hosting his mother at their house prior to the wedding and are faced with her opposition towards the outspoken Momma Joyce. Will there be a clashing of mother- in-laws and will Kandi find the strength to stand up to Mama Joyce, or will her powerful influence jeopardize the bride-to-be’s fairytale wedding?